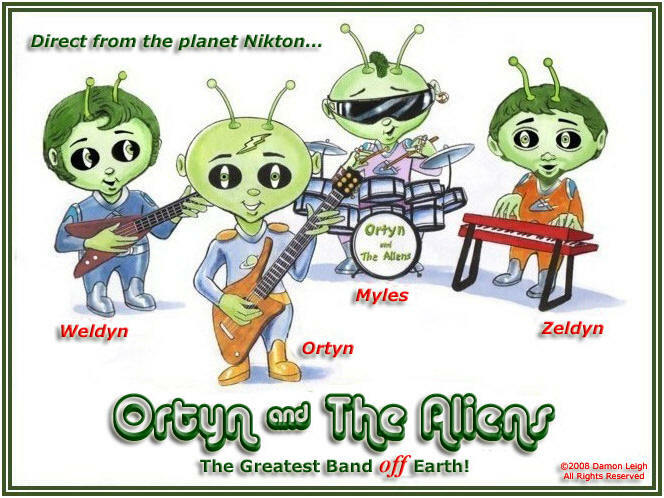 ﻿ Ortyn & The Aliens - The Greatest Band Off Earth! Planet Nikton is 50 light-years from Earth. Ortyn, Weldyn, Zeldyn and Myles are students at the Nikton Institute of Science. Spacecraft from Nikton can only fly at the speed of light. Ortyn designs a ship to potentially go much faster. As they build their flying saucer, ‘Lodestar’, they sing: “The Speed of Thought”. They need pynealeum crystals as super-fuel. It’s restricted. They go before the Science Committee to request assistance in obtaining some. The Committee insists that the four students submit their long overdue dissertation on the subject of antimatter before giving any consideration to their request. Ortyn, Weldyn, Zeldyn & Myles present their thesis musically. They sing: “Antimatter Chatter”. The Committee is not amused, gives them all failing grades and refuses to help them to obtain any pynealeum crystals. They ‘borrow’ some from a mine on Moldok (one of Nikton’s 19 moons). They’re nearly caught and barely escape. They’re sad because they can’t go home again. Ortyn cheers them up with: “Sing a Snappy Song!”. Twelve year-old Virginia "Ginny" Stanley lives in Franklin, KY. Her Dad, Mark, is county sheriff and Grandpa, Admiral Biff Bradford, is a retired astronaut. She's pro-Pluto and is dismayed by its demotion. She builds a radio to contact ETs. Late one night she broadcasts her message: “If Somewhere Someone’s Out There”. She drifts off to sleep. Ortyn and mates receive her message and beam her aboard. They become friends. Together they'll prove that Pluto's still a planet. She invites them to Franklin, settles them in Grandpa's basement and goes home. Next morning, while Ginny’s eating breakfast, Dad’s out for a walk with her dog, Laika. 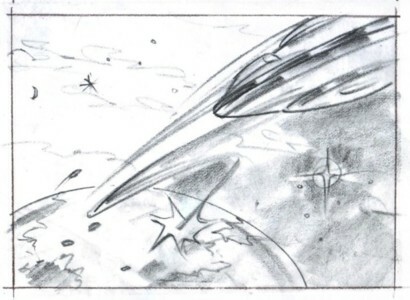 He spots the alien spacecraft sitting there in a meadow between his house and Grandpa’s. He summons his deputies to surround it. He phones the Governor for National Guard troops to help him capture the aliens and asks the Governor to alert the US Secretary of Homeland Security. Ginny overhears all of this. She’s stunned but she maintains her cool and quietly slips away to Grandpa’s house. Ortyn & his mates have been up all night watching TV music videos. 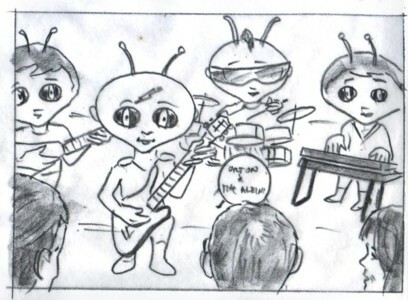 They find some instruments, form a band, call themselves “Ortyn & The Aliens” and write some songs. Ginny arrives. Blaring from the basement is Ortyn and The Aliens' theme: “We're Ortyn & The Aliens". Grandpa clambers downstairs from his bedroom. Ginny introduces him to the aliens. 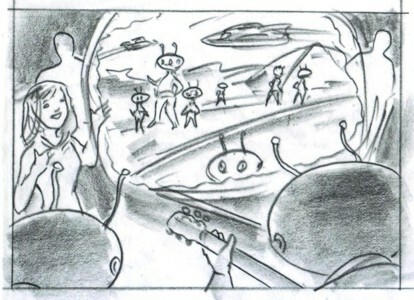 He thinks they’re just some kooky young musician friends of hers; not actually spacemen. Ginny asks Ortyn to prove that they’re really ETs. Ortyn suspends gravity in the room. Everyone and everything floats. Grandpa is convinced. Ginny tells Grandpa her Dad wants to arrest the aliens. He agrees to help them evade capture. Sheriff Stanley, with two of his deputies, knocks on Grandpa’s door. He insists on searching the entire house. 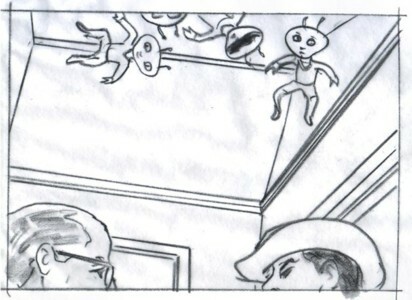 The aliens defy gravity and hide up against the ceiling. 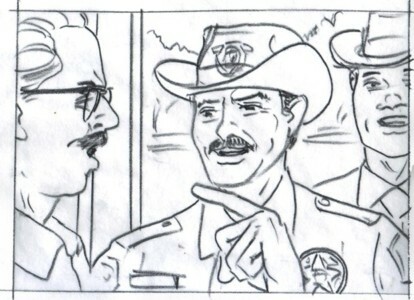 The Sheriff notices nothing unusual and leaves; but the intense manhunt for the aliens goes on… and now even the FBI has joined in. Ginny reasons that if Grandpa was fooled into thinking that the aliens were just weird musicians; they might easily hide in plain sight as a music band! Grandpa agrees. After dark, they all pile into Grandpa’s van and drive to Nashville. They’re stopped at an Army roadblock but manage to get through when an officer recognizes Admiral Biff Bradford, the famous lunar astronaut, and lets them pass. Grandpa’s best friend is music legend, Pat Boone. They go to Pat’s home to ask his help. Pat says that he can’t help… unless the aliens can actually sing. He leads everyone into his studio, sets up to record and asks Ortyn & The Aliens to audition. 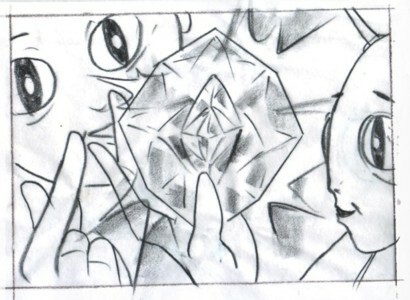 Ortyn reveals another of his Niktonian superpowers… visual thought projection. While he’s singing, he’s able to project his thought waves so that a music video appears as a virtual, high-definition, holographic movie above the band. 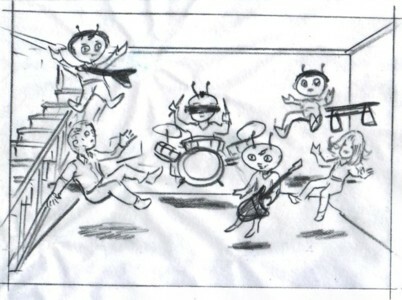 They perform: “Playtime at the Martian Zoo”. Everyone’s completely amazed and Pat Boone captures this entire phenomenon on Blu-Ray disc. Pat asks them to perform a love song. Ginny joins Ortyn in a duet as they sing (and Ortyn visually projects): “Puppy Love on Saturn’s Rings”. 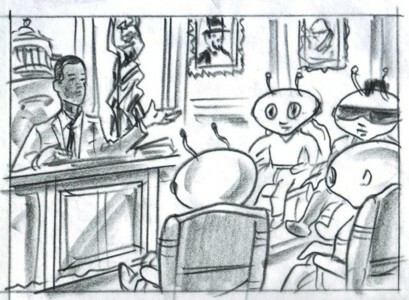 Mr. Boone agrees to help them get a show business deal so they can gain acceptance on Earth. He has some meetings scheduled on Music Row over the next few days and will talk to his contacts then. Pat tells Grandpa to take everyone back to Franklin and wait. Near Franklin, a Sheriff’s patrol car starts chasing them. They think the jig is finally up. Grandpa reluctantly pulls over. The aliens hide beneath a blanket. It’s friendly Deputy Johnson! He recognizes Ginny and Grandpa. He only stopped them to tell Grandpa that one of his tail lamps is burnt out. Grandpa assures him he’ll have it replaced first thing in the morning. The deputy lets them go on. They arrive at Grandpa’s. Ginny runs home. Little sister, Amy, is crying. She’s really scared. She heard Dad say that there are dangerous aliens on the loose. Ginny asks Amy if she can keep a BIG secret. 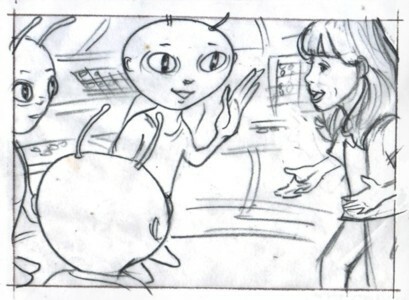 She tells Amy not to be afraid because the aliens are very friendly and they’re staying over at Grandpa’s. Next day, Ginny’s back at Grandpa’s. Little Amy accidently lets her big secret slip to older brother, Todd, who promises not to blab. Notwithstanding, he promptly tells his Dad; and an army of soldiers, deputies, SWAT teams, state troopers and FBI agents surround Grandpa’s house. It’s a standoff! The Sheriff shouts through his bullhorn for the aliens to come out with their hands up. Ginny sees her brother, Todd, loitering behind the troops. She realizes that Amy told him and he told Dad. She’s mad at them and wishes aloud that she never had a sister or a brother. Ortyn & The Aliens sing (and Ginny joins in): “We All Need Family”. Ortyn & The Aliens then peacefully surrender and are carted off to jail. The FBI agents give Ortyn & The Aliens the third degree. Where are they from? Why are they here? Who and where are their accomplices? Where are their weapons? The Aliens explain that they’ve come alone from Nikton, they mean us no harm and they have no weapons. They just want to be friends with the people of Earth. Needless to say, no one believes them. They’re secretly brought before mean old Judge Lionel Potter and charged with plotting to destroy Earth. Judge Potter calls them terrorists, finds them guilty and sentences them to life in prison! The telephone rings at Grandpa’s. It’s Pat Boone calling to say that a major record company and a big TV network want to sign Ortyn & The Aliens. Grandpa tells Pat what’s happened. Pat suggests that since they both know him well, they take Ginny and go to Washington to petition the President to pardon the aliens. The President agrees to meet with the aliens but he won’t pardon them unless he’s convinced that they mean us no harm. They’re brought to the White House. He queries them at length and concludes that they are innocent and harmless. The President tells the aliens that his favorite scientist was Dr. Carl Sagan. Right there, in the Oval Office, they sing: “The Cosmos & Carl Sagan”. He asks if they can simplify Einstein’s Theory of Relativity… to make it easier for school children to understand. They happily launch into: “Everything Is Relative”. The President asks their opinion of the Big Bang Theory. They sing: “Big Bang Baloney”. Then he asks what they’ll do to make Earth a better place. They reply that they’ve written a special song just for Ginny to sing: “What Will We Leave Earth’s Children?”. They’ll also remind everybody everywhere to just: “Get Along!”. The President grants an unconditional pardon to Ortyn & The Aliens, makes them legal US residents and orders their spaceship returned to them. He appoints them to his National Science Council and invites them to apply for US citizenship. 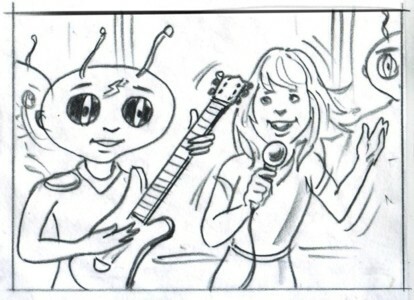 Ortyn & The Aliens get their own TV cartoon show and a multi-album record deal. 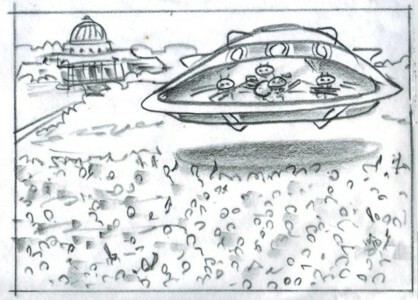 They convert their flying saucer into a transformer/performance vehicle so they can hover above any outdoor concert venue, set it down and open it up to reveal a spectacular stage with laser lighting effects, amplifier stacks, etc. They go on tour to promote their debut CD. In New York’s Central Park they perform: “Where Are You Comet Halley?”. In Chicago’s Lincoln Park: “Black Hole Patrol”. At the Los Angeles Memorial Coliseum: “The Planetary Diet” and at the Plaza del Toros in Mexico City, Ortyn y Los Aliens' Tema: “Son Ortyn y Los Aliens”. In Rio de Janeiro, on global TV, they address the Int'l Astronomical Union. They make the case for every kid’s favorite member of our solar system; singing: “Pluto’s Still a Planet!”. The IAU restores Pluto to planetary status. Children around the world rejoice as they celebrate their new heroes, Ortyn & The Aliens. 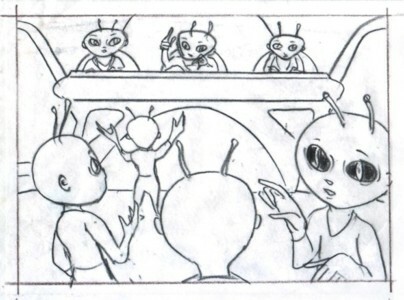 Ortyn & The Aliens have become America’s ambassadors of friendship and good will. The President summons them back to Washington. He awards them the Medal of Freedom and invites them to light our national Christmas tree. Upon flicking the switch, together with their friend, Ginny, they sing: “The Joy of Christmas Day”. As Christmas Parade Grand Marshals, they ride through the streets of our nation’s capital with Ginny, Grandpa and Santa Claus, himself, on his sleigh. They wave to the huge crowd that includes the entire Mark Stanley and Pat Boone families. The parade ends at the US Capitol. In tribute to their newly adopted country, along with Ginny, the President, Grandpa, Santa Claus, the Stanleys & Boones, and joined by the US Marine Corps Band, Ortyn & The Aliens sing: “I Love This Land”.